This set is economical, durable, and versatile. 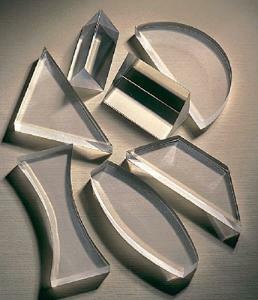 Housed in a convenient plastic container, this set includes seven clear acrylic elements. Each elements has one frosted surface that reveals the path of a light beam passing through. Ordering information: This kit includes a double-convex lens, double-concave lens, semicircular lens, trapezoidal lens, small right-angle prism, equilateral prism, and large right-angle prism.